Now you can e Cig liquid at discounted prices! We are happy to bring you a high quality ecig Liquid in amazing flavors. The e Cigarette eliquid, also known as the Nicotine e juice or efluid, comes in different flavors and density levels. 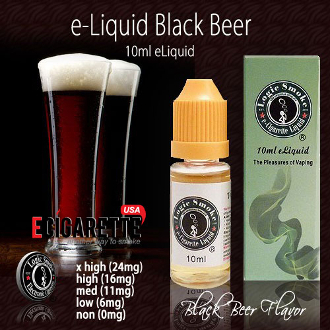 Our fine Black Beer flavor e cig liquid delivers an enjoyable smoking experience. The e cig liquid is the best solution since it is so easy to use and saves a money. Inside the cartridge is a small fluffy pad - it is your nicotine cartridge. This is where you will drip a few drops of e cig liquid each time you want to refill your e cigarette cartridge. All it takes is 3-5 drops of Black Beer flavor e Cig liquid to refill your cartridges from the e liquid Bottle. Take advantage of our great e Cig liquid deals and save with the best e liquid solution available on the market! Note:There are several ways to refill your eCigarette cartridges, by dripping directly onto the cartridge, or by using a syringe with a needle. To use the syringe simply extract e-liquid from the bottle using the syringe needle and then inject it as needed into the cartridge.